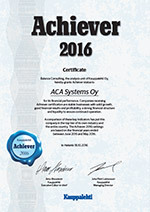 ACA Systems Oy was founded in 1986 in Polvijärvi Finland. The first developed analyzer was called ACAX, an energy dispersive X-ray elemental analyzer for the mining industry. In 1991 we launched the ACAV ultra-high shear viscometer to the paper and board coating industry. 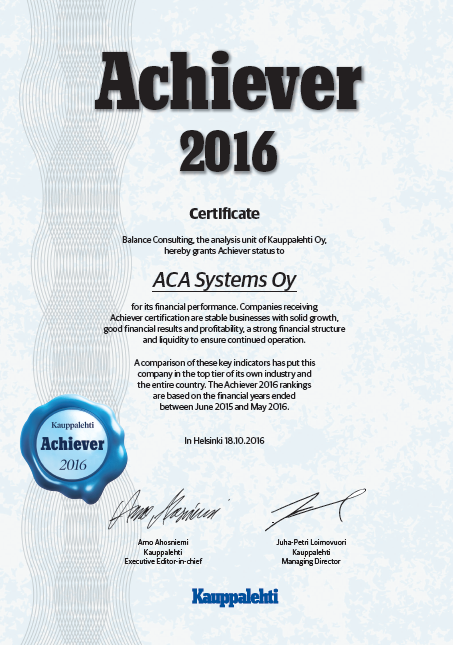 The analyzer was a breakthrough and brought ACA Systems to the international markets. In 1999 we started to design online air permeability analyzer for measuring process stability and product quality in paper making processes. First delivery was in 2001 and since that we have delivered over 200 ACA Permi systems worldwide. In 2014 we finished another intensive development project and launched ACA ROQ roll quality analyzer. It measures roll hardness profile and is able to eliminate problematic rolls from the supply chain leading to significant cost savings via less customer roll claims. Today we offer all roll industry operators from manufactures to finishing converters a comprehensive services, high quality measuring equipment solutions as well as modern data handling platforms. Our heritage has been always to provide information that can lead more stable processes and better roll quality. We are inspired to develop new solutions by working together with our customers and partners. Do you have a specific process or roll quality issues to be solved? Contact our staff or channel partners. Channel partner program: Want to become our channel partner? With our modern and effective channel partner management working with us is a real win-win situation.